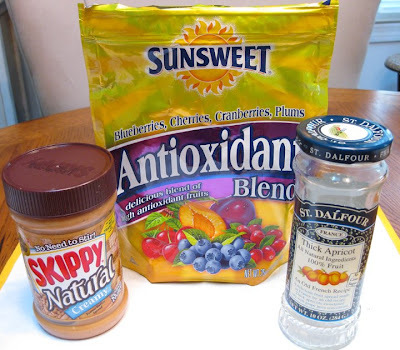 They are packed with protein from the peanut butter, antioxidants from the berries, B vitamins from whole wheat flour and wheat germ, and heart healthy fats from the walnuts. Although there is a fair amount of butter used in this recipe, I replaced half of the saturated fat in a typical bar with a healthier fat ~ canola oil. So you still get all that buttery flavor with a lot less fat! The inspriration for these bars came from one of my favorite desserts that my mom makes; her Apricot Bars. They are buttery, crunchy and fruity all in one. In one word they are heavenly. The only thing is that I end up eating way to many of them whenever she makes a batch. I think I devoured 3/4 of them in one sitting once. NOT GOOD -( 'Er well they were good, but not good for me.) I shutter to think of the calories and saturated fat that I inhaled on that fine day. Press half of the dough into a parchment or foiled lined bake sheet and then load on the filling! 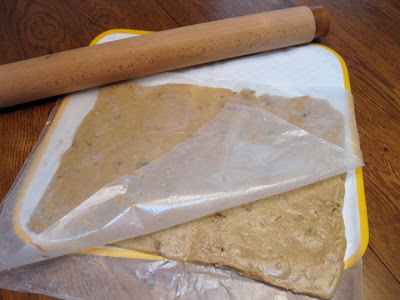 To make putting on the top layer of dough easier, roll it out in between 2 sheets of waxed paper. Lift off the top sheet, turn over, place on top of the filling and remove the 2nd sheet of waxed paper. When the bars are light golden brown, remove from the oven and let cool. Grab the edges of the parchment paper and lift the bars out of the pan. Cut in half and then into equal size bars. In an electric mixer or large mixing bowl blend together the butter, sugars and oil until creamy. Add the egg and extract and blend until well combined. Add the wheat germ. Sift the flour, baking soda and salt in a medium bowl. Add to the butter mixture slowly until just combined. Gently mix in the walnuts. Reserve half of the mixture (about 1 1/2 cups) and set aside. 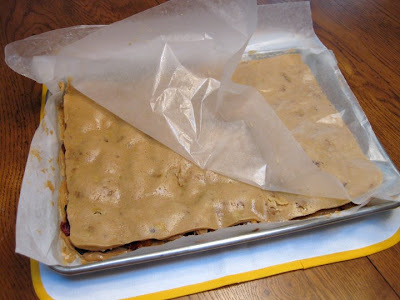 Press the mixture onto the bottom of a 8 1/2 x 12 inch (or 9 x 11) baking pan lined with parchment paper or foil. Spread 1/2 of the peanut butter over the mixture evenly. Dot the preserves all over, staying within 1/2 inch from edge. 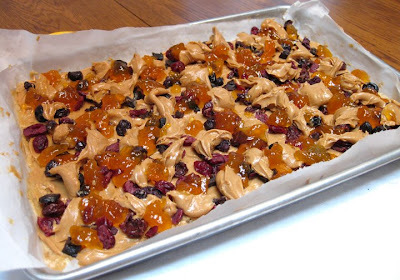 Sprinkle the dried fruit evenly over the top. Dot the remaining peanut butter evenly over the top. Place reserved mixture between two sheet of waxed paper. Roll the mixture to the size of the pan. 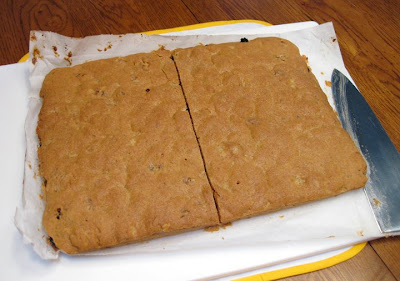 Remove the top piece of waxed paper, carefully flip it and place on top of the prepared mixture in the pan. Remove the remaining waxed paper. Bake for 40 to 50 minutes or until light golden brown. Cool completely. Grab the edges of the parchment paper and lift the bars out of the pan. Cut in half and then into equal size bars. Love these bars, like the idea of having the peanut butter and the dry fruits in it. Looks really yummie, really a great way to start your day. Have to try this! Oh yum - those bars look so satisfying!! My daughter would go crazy for these bars. She practically lives on peanut butter and protein bars as it is. Teenagers! 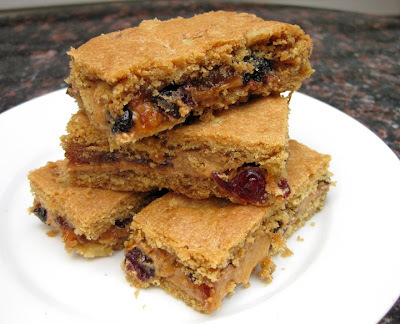 MMM, pb :) these bars look great! They are just a little "sinful", right? My goodness. I just created a recipe similar to this last night. Well, except it's not healthy at all. These look SO good. I prefer them over mine. Mine were a bit greasy. Those bars are for me! I love that kind of speciality! Yours look really scrumptious! These look FABULOUS, can't wait to try them! !